I don’t have videos of Charm’s recalls yet, but she recalls wonderfully while being restrained, in the house, in the yard, and at the park. But the other day at the beach there was no calling her off anything. This was surprising as it’s the first time she would not call off distractions. She is a Spaniel and there were birds, waves, etc. Next time we go to the beach I will keep her on a Flexi Lead. I am uploading a short video showing the difficulty with Frog. She sometimes does it all on her own but I have not been clever or fast enough to capture it with clicker and reward. I can’t seem to lure her in to frog as she always crawls with her hind legs as I attempt to lure her forward in to Frog. Well, she sure is persistent, trying to get that treat! 🙂 There were some moments she is stretching a little bit that you could click, but it’s true she then pulls the leg back under her immediately… I think a pillow would make it easier, so maybe try it that way. And when she does it on her own, don’t even try to find a clicker to click it 🙂 -- just mark it with a voice instead! As for recalls, restrained recalls and recalls from a stay are definitely MUCH easier as “normal life” recalls as from a restrain or a stay, you’re recalling a focused dog and from “normal life”, you are recalling a distracted dog. That’s a HUGE difference! Of course, restrained recalls are a great start, but then also try recalling from normal life, first at home, then on walks when you see there is nothing interesting around and then slowly add distractions. Da Vinci’s inability to recall off of the sheep last week is a perfect example of this. He has wonderful recall at home, class, and in other less exciting places. When he had sheep, he didn’t even hear me. After some work, he started to get it…I realize you can’t contain the birds to practice like we could with sheep, but you can work with the waves. Finaly our first video. The biggest challenge is the frog, she has newer done it by her self, but i think she gets it. The video is from our 2. try. You sure don’t seem to have any problems catching up! The plate is good enough, we need it for circling and a paw touch, she knows both. Maybe one little detail: to get her off the plate, the best is to make her chase a treat as opposed to having her follow your movement, it’s somewhat confusing as when shaping, you don’t really want the dog to follow, but to think independently. Food ignoring is great and yes, that’s a VERY good frog for just two sessions!!! Almost ready for a lower pillow! Great job and a really nice dog! Thanks for your video! I finally see how I can get frog legs-for some reason it wasn’t making sense for me about how to use the pillows-now I get it! Here is our first video. Other videos lasted more than five minutes. In the beginning Deusty doubted a lot, he didn’t understand what I wanted and he didn’t dare. Now he is happy doing the exercises except the number 3. The frog is a big challenge for us but it’s very fun and motivating. Great job! The frog is great, time for a lower pillow and the box is also good enough to go to a smaller one. Everything else is going well too, but you could definitely click some more, especially if he is a little reluctant to offer behaviors. For example: when you are trying to get another foot on a plate, you can click for any movement of the left paw or even just one paw on the plate if it’s the left one, considering that he keeps it on the floor mostly. Stepping over is good too. And then definitely click and jackpot when he puts the other one up too. It’s really important to click&reward A LOT at the beginning, when the dog is still learning the concept, lower criteria gives you more to click and makes you progress faster. Same with food ignoring: make it easier by keeping treats in a fist and closer to you first to have more to click and then make it more difficult gradually. It’s not really fair to start off so difficult as I think he was originally trained by luring? So not going for food is really new for him. Deusty is adorable. He reminds me of my Sheltie, Cash…everything from markings to his behavior. Mine even does that cute little sort-of step on the plate and sort-of paw at it. Too funny! Here is our homework for Lesson 1. I taped this in a different room than we usually train. I wanted you to see the performance in a different environment. The bowl was the only thing Ruby had a little trouble with. Hi Silvia, this is our video of lesson 1. We had some troubles with the pot here. Fine never before did “bowl” with this pot, so we added the sequence with the pot she is used to. We only can do frog with one leg since now, but I think we will have a two leg frog in a few days. The frog is free-shaped. I didn`t really understand if we should do a paw touch only or a “step on a bowl or something like that”. We did a paw touch. The recall: Fine comes immediately after she is called -- because she always thinks there is a game or some food -- we do it on every walk and we have very much fun with it. Even if Clara and Zeder are tracking a habbit or something like that, Fine would come. That`s only because we did all the little games with her you advised us to do. That was too funny, she sure loves her boxes! That’s a very small bowl already!!! And the frog is funny too, one leg and then another and then back 🙂 I’m sure you’ll have both in no time! One little detail: when she does that cute frog stretch, it was good to jackpot it! -- But do not click between one and another treat if her leg is back under her again!!! For action, you can only click once -- and then give plenty of treats if it was a really good one. But it’s only for duration, when the dog is keeping the right position, that you can click&reward several times in a row -- like the second time, when she is keeping the leg out longer -- but the first time was not right. Happy to hear that about the recalls, that’s the most important thing for sure!!! I have a question about the food refusal. You recommended to use a command or a click to kind of “release” the food. I started off with clicking when she did something else but looking at the food. But then I thought “what am I clicking for now??”. So I stopped using the clicker and just presented her the food at the moment I decided she could have it. You are right, it’s better to have command for that. Or do you think I should use a click anyway? If I think a bit further, is it a good idea to have three “get it” criteria? 1. a click, 2. a command (get it), 3. a release command “go”. I already use the “GO” when we feed her. She will not touch the food in het bowl without the Go. She will also not leave her crate, car… without a release “Go” is one of her release commands. She has three release commands, GO (will be used in agility later on for the start and the contacts in case I fail to teach her runnings ;-)), YES is a release that all our dogs know and they can be released all at the same time with YES (let’s call it a “Pet” release there were GO is an agility release;-)) and her name (each dog can be released by their name while the others stay). Sure, you can use “go” for that! You could also click first -- clicking for anything but trying to get food -- but yes, if you’re not shaping something specific, you don’t really need it, you can just say “go”. This is my first attempt at posting, so hope it works! This is Keeva, she is 9 weeks old (a puppy I bred myself). We have just progressed to a smaller tin for the four feet in and she got it first attempt. I will continue wit the smaller tin for another couple of sessions before attempting the small bowl. I am having real problems with the (what I call) froggy legs. She sometimes gives me the behaviour and then sometimes gets very frustrated, as you will see from the video below. I am also unsure about using the food in front of her to lure her since I have been using the food in front of her in another exercise and rewarding her for ignoring it. Will this confuse her? 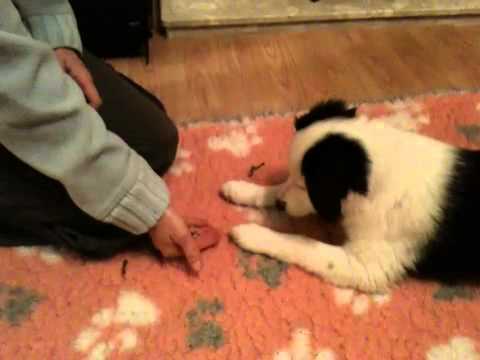 Having great fun with teaching my pup these exercises though. I will post a video of Kruze, our other 9 week old puppy, shortly. I fell a bit behind the last few days. 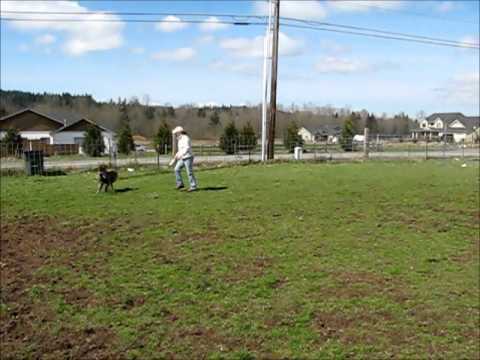 Silly me…I took the dogs herding and to a trial instead of keeping up on our tricks ;)!!! Da Vinci’s evaluation on sheep revealed some pretty incredible herding talent! But we are back to it and getting caught up. Sorry this is late. Frog is still very hard so we are still working on it. I focused on the box for video since he has been doing well with the plate. 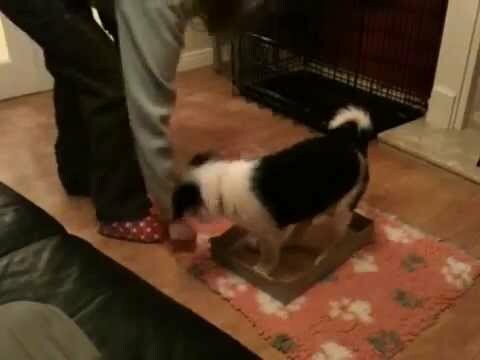 Here it is…big Terv puppy in the shrinking box! I turned around from setting the camera and he was standing in it. Good boy. Used the big box and added things to it as you suggested. At the end, he got in the smaller basket. Should I expect to get him into any smaller boxes eventually? Ok. We will keep aiming for smaller. Last night and today, we started getting some actual progress with frog. Starting to get it with luring. I have a question about capturing it though. All three of my dogs will do it when they are playing with each other and I don’t know how to capture it then. I just end up interrupting play and all of them think I’m joining in to work with them so its rather confusing. I tried marking it and really identifying the dog who was doing it…then took her to the treat jar. It was less chaotic, but I don’t’ know that she really understood what she was being rewarded for. I video taped the herding…it’s pretty cool if you’d like me to post it to your Facebook page or email. Yes, my dogs are somewhat surprised when I try to capture too. What usually works best is a combination: I try to shape it in training sessions and capture when they do it in their normal life and somewhere on a way, they make the connection and have the “aha” moment that gives me a final version also in a training situation. It’s a very interesting moment to observe. And yes sure, would be great to see a Terv herding! You can also post it here! When I do capture it, I should expect to click & reward only the one time, correct? Not be able to capture and then shape from there unless they do it without the other dogs around? Here you go. Da Vinci 7 months. Yeah, it’s mostly more of a one-time click yes, especially if you still need to go search the reward… 🙂 Great job on sheep too! He sure is having tons of fun! Finally, I hope this works. I accidentally posted to You Tube as private. that is why I couldn’t find it. Here is my 1st & 2nd Video in one for lesson 1. #1. Frog:(my straight leg = seal, bent leg =frog) She would have one leg straight & one bent, when I would click as she straighten her leg she at the same time bend the other one and thought I wanted a crawl. So I just had her in front of me so she couldn’t crawl forward. What should I do to prevent it into a crawl, also add a stay? #2. I want to name it. So when she hits the position I say the name. Then do I slowly start saying the name just before she gets into position and then finally before she gets in to he position? #3. So was I correct when I want to increase duration repeat click & treat. The first time she does the trick jackpot? Great job! Loved that seal circling around the food, that was too funny! I would probably go for both, seal crawling and seal stay, that should be easy to get. For duration, you can click&reward several times, for jackpot (a really big step forward), you click once and give many treats or better treats. And yes, name it as soon as you see she will do it. Great job also with 4in!